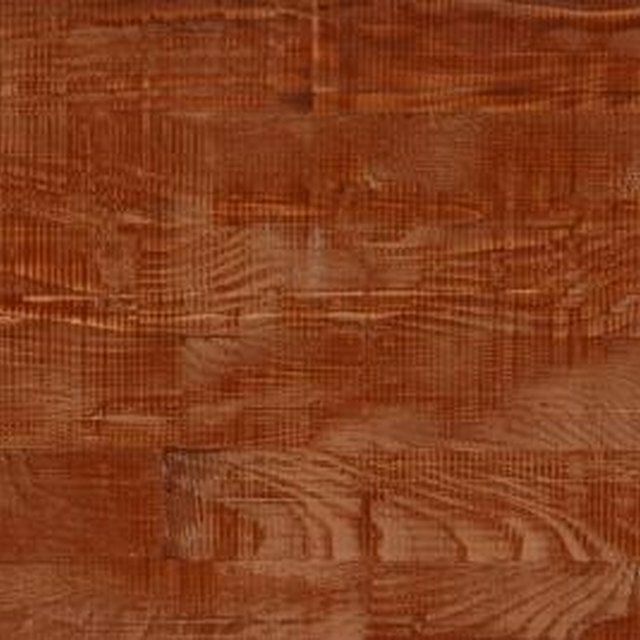 Teak is a very hard, dark wood that has a pithy, mahogany-like grain. Refinishing veneer should be approached with caution regarding the tools and chemicals used. The thin nature of veneer makes it especially susceptible to damage. The dark color of teak can also be an issue. The original finish will need to be removed sufficiently to open the grain, so that the new finish will apply evenly. Using stain and clear finish all-in-one will help, since it does not penetrate as deeply, resting on the surface. Teak traditionally has a dark finish. Put on chemical resistant rubber gloves and eye protection. Use a disposable paintbrush to apply a coat of water-base stripper to the surface of the veneer. Allow the stripper to work for the length of time recommended by the manufacturer. Scrape the stripper and old finish from the veneer using a plastic scraper. Rinse the surface with a rag dampened in odorless mineral spirits to stop the stripper's chemical action and remove any remaining finish. Sand the surface of the veneer with 220-grit ultra-fine sandpaper working with the grain. Remove the dust from the veneer with a tack cloth. Select a color of all-in-one clear finish and stain to complement the surrounding woodwork and room decor. Choose medium to dark colors for teak veneer to get best results. Apply the all-in-one finish and stain with a soft, fine bristle paintbrush. Work in straight, overlapping strokes following the grain. Spread the finish as evenly as possible to prevent runs and drips. Allow the first coat to dry thoroughly before applying a second using the same technique.